Of course he was at the time in violent disagreement with a system being proposed where the largest five firms produced the SP’s. And of course he would have been right. To permit those same firms to control the returns, when their off course empires were of such high worth in comparison to a veritable ‘cottage industry’ – would clearly disfavour punters. Any notion of those same organisations using their on course positions to actually bet competitively – and disfavour their huge shop and mobile empires, would have been nonsensical. Mr Reams hasn’t been seen in the betting rings for many years to the best of my knowledge. It’s my conviction the SP mechanism – in its current form, was practicably out of date shortly after its inception and requires thorough modernisation. Not abolishment. The commission, in its call for responses to the system, makes clear it supports little to no change to the system. That we are afforded a workable and simple mechanism, which provides for such as guaranteed odds against SP. Why the commission feels ‘board’ prices would disappear in any revisions is beyond my understanding. Perhaps to scare people into the false belief that show odds would be consigned to the bin. It’s rather apparent the SPRC depends upon the advice and views as reported by the press association staff, tasked with returning a fair SP from the racetracks. They are neither witness nor party to discussions between bookmakers – and their customers. Their honesty is not in question here- but they clearly cannot have the ground level experience to report accurately what is really transpiring. The dynamics of betting have fundamentally changed in the last 20 years, whence the current system was put in place. In that time changes have been few and limited in nature. 20 years ago a pitch at Sandown at the top of the rail would have been worth well in excess of £100,000 – and very hard to come by. These days – those same pitches can be purchased for less than a third of that value- and with minimal interest, most certainly not from someone trying to get into racecourse bookmaking as a career! In the same 20 years- the average turnover per race to on track firms would have declined to not less than 1/6th the value of the late 1990’s. Midweek racing has declined in interest to customers to attend. Rings are often ghost towns. Few punters turn up, and in a cashless society they have less to spend with bookies trading. Mobile betting apps have taken over – being more aggressive in nature, easy to use, from funded accounts and related to offers. Racetracks have taken over betting at some tracks –and this new competition to the business a track bookmaker is afforded will have significant impact on their very existence. At the same time as this decline has been evidenced- the off track firms have increased in size, technology advances, and power. Where once betting rings were vibrant and busy, with standard place terms, minimum lay to lose guarantees – and by extension a useful ‘guide’ to SP’s – now they are ripe only to cheap manipulation of their odds. Huge multi national betting concerns can control a weak market with veritable pennies. This imbalance would simply be outlawed in any other financial sphere. It is important for the SP commission to give this point full consideration. Off track firms are, by extension, accepting wagers – and risk, on shows therefore based almost purely on exchange odds. This is a far from healthy system – and a central plank for lower levy returns – down over 50% in recent times. Most bets are accepted at board odds- rather than the more ‘protected’ SP returns. Off track firms do not ‘trade’ wagers in the manner in which on course firms do. To boot, since the shows being returned are up to one minute behind changes in exchange odds, off track firms find themselves subject to arbing from punters. This business is unprofitable and most bookmakers close accounts from those engaged in this practice. Such moves are unpopular and leave firms open to unjustified criticism. Let us consider the actual SP – in practice most track firms have stopped trading aggressively, or at all – it’s often too risky to bet to exchange odds and risk a sizeable wager which a bookmaker cannot trade, with the exchange, in the limited time before the off. Prices are revised downwards throughout the ring – or unavailable. Most books are structured and the operator is loathe to change it. Large operators, such as William Hill on course, are naturally particularly mindful to ‘bet well’ with one eye understandably on their important off course entity. In my experience their returns are given considerable weight in any return. SP’s are, in practice, more favourable to the industry for these simple reasons. It is common in circumstances to hear criticism of course bookmakers for failing to balance books by pricing up horses which they have not significantly laid, at times when they take substantial monies from legitimate hedging activity happening fast and late throughout the ring. Through the year we will hear many examples- the Grand National being a notable one, of an overround which disfavours punters betting at SP. Further, the notion that bookmakers should counter raise odds when there are often no punters to offer those odds to, is fanciful. Finally, large entities sending money back to the tracks place their wagers as late as practicable, certainly never 20 minutes before the race for example. Again such practices, as in the likes of FOREX, would be viewed as questionable. Is racing somehow different? I am not suggesting they are not fully entitled to boss the SP’s, but there are issues of scale and timing. The current mechanism employs a bank of up to 25 firms at the largest meetings. At the lesser meetings it is exceptionally difficult to find 25 firms, betting within the commission’s guidelines, to return an SP. The SPRC has revised the number of bookmakers required to return an SP to below the level which caused such upset between the NJPC and the commission in the 1990’s, when 66 questions were tabled on the subject The commission has also modified what it permits to return a show to below the accepted industry standard terms and without requirement for a minimum ‘lay to lose’ figure. We are of course well aware that the Grand National return in no way accurately reflected a fair return. Whilst I would argue that 1.66% per runner is by no means excessive- the truth remains the show embarrassed bookmakers on course, and will lead to customers choosing not to wager at the racetrack at all. Many firms were offering 9/1 the favourite – which was returned at 6/1- at the same time the exchange was offering 14.5 on Shutthefrontdoor. Bookmakers not included in the sample are routinely ignored. Bookmakers within the sample are often asked to accept wagers at less than the odds they are currently displaying. Particularly at small meetings. Is there clear and incontrovertible evidence that this goes on? No. It is however, quite routine to be asked to ‘co-operate’ on shows in return for the crumbs off of a large concern’s table. If you co-operate – you benefit. IS this system of hedging fair? Not if a wager is proffered ‘with hooks’. Any discussions with other firms will confirm this is precisely what goes on. It is totally acceptable for a large concern to wager to control a price which reflects the full weight of money. But not where said concerns can control a the market for such a tiny outlay and by openly requesting the bookmaker to cut his odds in return for a nominal wager. 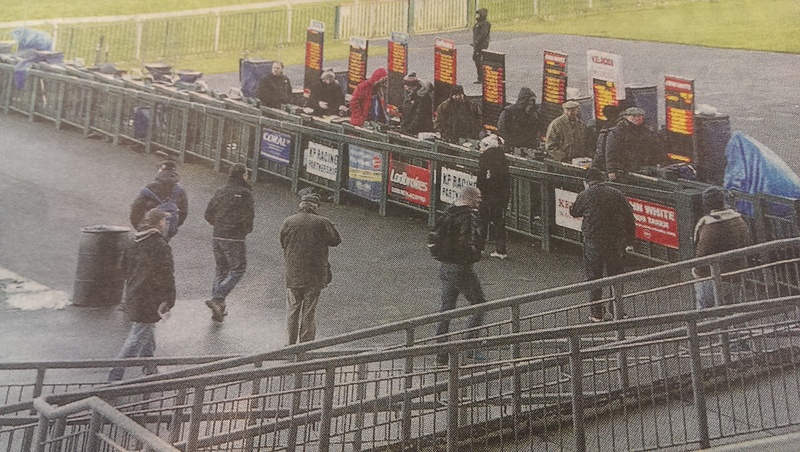 What should concern the SPRC, is the effect on a fair mechanism of such large concerns wagering with such a tiny entity as three to eight bookmakers trading an all weather track for example. What also should engage thinking, is the possibility of manipulation of weaker exchanges on small markets. Especially when one considers RDT controls well in excess of 90% of on course firms and produces software designed specifically to encourage the practice of trading. In reality, it is Betdaq- the weaker exchange of two, who govern on course returns. In my view this could be viewed as a cartel. It takes a tiny movement of exchange money – typically less than £10, to be followed by several on course layers. First, and rather obviously, where the SP itself is required to be revised downwards, it can be easily controlled in a market devoid of regular punters with a very small ‘hedging’ fund. Large concerns represented on course can constitute up to 50% of those available to govern an SP. Especially as the SPRC mandates that in the strongest rings at our festivals, only up to 25 firms are required to return the show. Hedging can therefore be restricted to just those firms. This is precisely what occurred at Aintree. Indeed one pivotal operator, running multiple pitches, informed me ‘where he was in the sample, he was 6/1, – where he was outside the sample – 9/1 about the favourite’. If all operators are betting to the same commercial terms – there’s really no need to limit the number who return an SP, and it’s clearly a system which fails the means test in such areas. Centrally the landscape of betting is unrecognisable – were we to compare it with 1995. The SP regulatory commission is recommending we keep a system where the ‘show’ odds for fancied horses directly mirror exchanges and where the SP is ‘protected’ by circumstances. Where small time traders – desperate for any bettors can be easily bullied by larger operators and where punters feel they are being cheated (unfairly) by track firms. Track bookmakers who wish to include their data in any new return, must undertake to lay any advertised price to a minimum of £100 – to include to other operators. Agree with much of what you say. Given the development of exchanges, smartphones and betting apps, the current SP system is well past its use by date. Also, we need less low grade racing and something to narrow the gap between prices available on course and on Betfair – before we lose the betting ring in its current form and to try and get a few more people through the gates of the racecourses. On that, I think that racecourses running low grade races on unpopular midweek days, should be encouraged to reduce their prices – say a fiver for punters for low grade AW flat at Lingers on a Tuesday in February and correspondingly reduce the charges for bookmakers. Without punters there’s no betting ring. Without an active betting ring there’s no punters. Racecourses need to get both through the gate to improve SPs and make better experience for all. Really, what you would like in a ideal world is a SP generated from a High Street median only and argue that the ring doesn’t owe the highstreet punter any favours, sat drinking free coffees, so why should the ring activity enhance any high street returns? I do realise that this doesn’t stop the high street kicking the tumbleweed out of the way knocking the one man and his dog out of the way, and arbing on course, but that would then only be to claw back some doe rather than to manipulate the market. The bitterest pill for high street punters is this feeling that the house favouring table we all accepted when we placed that first ever bet, is fast turning into a rigged table. Highstreet do not want to take horse bets, they are all coming out with these cards now, that you scan before every bet, the sole purpose is to weed winners out, I was told in a Lads in town the other day £50 max at 5s because I didn’t have an odds on card and wasn’t known to the cashier, that’s not me being known as winner, that’s just me not being known! I have had my Bet 365 closed after A Lucky 15, it payed less than a grand, Sky Bet have limited every bet I place to a £100 payout after backing Trip To Paris In The Chester Cup (£50 at 12s!) it’s got so that the only place I feel confident I can have a bet is on course, and that’s changed within the last 18 months. We have got a fixed odds obsessed high street, gorged on percentages and algorithms devised by some red bull addict that hasnt seen daylight for years, sat in basement of some hell hole on the rock. IBAS aren’t worth the company registration, the racing post daren’t print a word of it because they are front to back subsedised by the high street. When people say racing is heading for a slippery slope, they are wrong, it’s already gone. The major operators are totally devolved from the mechanism – despite the fact they’re the ones doing all the business. The very landscape of betting has changed and betting rings, which I love, are decimated and no longer in many meetings fit for purpose. SP and SP overrounds have become a toy for many interested parties to play with. The High Street wants ‘reasonable’ profit margins, for its diminishing horse-race business, but no longer feels the need to hedge on-course – pumping money directly into the exchanges, which inevitably leads the herd instead. On-course books are their own worst enemies, betting to 12%+ margins – todays clued-up punter knows to go elsewhere, so, on-course rings become weaker, and the industry stagnates. The sample is not ‘secret’ .. its obvious to anyone who wants to really look, and is clearly manipulated, to the benefit of the High Street – even thou they say, their horse-race business is diminishing. I feel an industry SP would help on-course layers. They could offer SP+ terms, which might attract clients back to the racecourse. On course books, who allow their prices to be price-pushed etc, are looking at the short-term .. and are, in my view, just defeatist idiots. The industry is in need of v major overhaul. The linking of pitches, pitch renting, price collusion, and price fixing, are all places to start – but, I have to say, I have no faith in the current leaders, who should be looking at these reforms. Previous Previous post: SP Regulatory Commission – Two Decades Out Of Date?